Labor organizer Padma Mehta is on the edge of space and the edge of burnout. All she wants is to buy out a little rum distillery and retire, but she's supposed to recruit 500 people to the Union before she can. She's only thirty-three short. So when a small-time con artist tells her about forty people ready to tumble down the space elevator to break free from her old bosses, she checks it out — against her better judgment. It turns out, of course, it was all lies. As Padma should know by now, there are no easy shortcuts on her planet. And suddenly retirement seems farther away than ever: she's just stumbled into a secret corporate mission to stop a plant disease that could wipe out all the industrial sugarcane in Occupied Space. If she ever wants to have another drink of her favorite rum, she's going to have to fight her way through the city's warehouses, sewage plants, and up the elevator itself to stop this new plague. Adam Rakunas has worked a variety of weird jobs. He’s been a virtual world developer, a parking lot attendant, a triathlon race director, a fast food cashier, and an online marketing consultant. Now a stay-at-home dad, Adam splits his non-parenting time between writing, playing the cello, and political rabble-rousing. His stories have appeared in Futurismic and the Magazine of Fantasy and Science Fiction. Windswept is his first novel. "This twisty David-and-Goliath tale is clever, fast-paced, and frequently funny, taking plenty of well-deserved potshots at corporate greed." 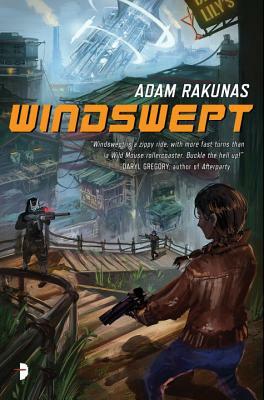 "Windswept is a classic noir story shot full of space-rum and rocketed into the future. It’s not anything so simple as a thriller with a layer of chrome and some plastic ray guns tacked on; this isn’t a Chandler pastiche in nerd-drag. The future tech is integral to the story, and Rakunas clearly enjoys building out a science fiction world." “Seriously, this book is just plain funny. Even so, it manages to present an interesting perspective on politics, consumerism, and unionizations. So if you want to read about Co-Ops, giant crab attacks, sewer chases, and the inadvisability of copying techniques from the movies,Windswept is definitely worth a look.” 4/5 stars. "This grunge world science fiction adventure is one of the best debut SF adventure novels Your Humble Reviewers have read recently."